Community-based monitoring, reporting and verification (CMRV), is the involvement of local people in the monitoring, reporting and verification of carbon stocks and other forest data. This approach to forest monitoring can potentially provide cost-effective and locally collected biomass data, promote equality in benefit sharing, and maximize the social and environmental co-benefits of work around reducing emissions from deforestation and degradation, known as REDD+. In August 2014, participants from more than a dozen countries came together for a workshop in Guyana to share and test tools, approaches, and lessons learned on this work. The workshop was organized by Naikoa Aguilar-Amuchastegui, MRV Coordinator for the WWF Forest and Climate Programme, along with collaborators at WWF Guianas, the Global Canopy Programme, and the U.S. Geological Survey SilvaCarbon Program. 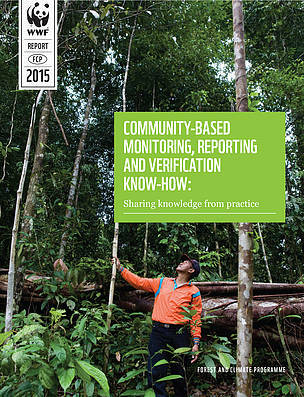 This report, Community-based Monitoring, Reporting and Verification Know-How: Sharing knowledge from practices highlights the impacts, challenges, lessons learned and trends that emerged from this workshop, and serves as a resource for others focused on similar efforts.